Google has continued with its investments in clean energy projects. On Monday the company announced its biggest investment in solar by far. Google has invested $168 million in one of the first utility-scale solar projects by BrightSource Energy. The project is being built in the Mojave Desert in California. Last week the search giant also announced a smaller $5 million investment in a German solar photovoltaic (PV) plant in Germany, making the placement Google’s first clean energy investment in Europe. The solar plant is located in Brandenburg an der Havel near Berlin. It is one of the largest in Germany. Before the massive investment in BrightSource, Google’s clean energy investments have been relatively small. The company has made multiple investments in cleantech startups in recent years, and last year it announced it was planning to invest $38.8 million in wind power projects built by NextEra Energy Resources in North Dakota. All up, Google says it has now made a significant $250 million worth of investments in clean energy. 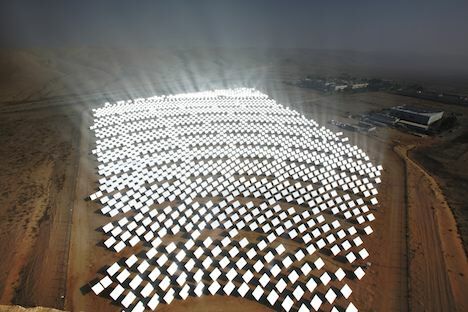 BrightSource Energy develops solar thermal projects, which use lenses (see image above) to concentrate the sun’s energy and convert it into electricity. The new investment will go towards BrightSource’s Ivanpah solar plant, which is slated to produce 392 megawatts of electricity. The plant is expected to be running by 2013. This solar investment news comes on the back of the recent announcement by GE that the conglomerate has made a massive $600 million investment to start manufacturing solar panels in a new factory, set to be the biggest in the U.S.
It’s becoming clear that solar energy is starting to be big business.